Polyuria is a condition where the body urinates more than usual and passes excessive or abnormally large amounts of urine each time you urinate. 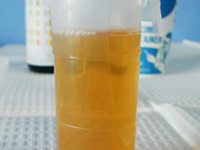 Polyuria is defined as the frequent passage of large volumes of urine - more than 3 litres a day compared to the normal daily urine output in adults of about one to two litres. It is one of the main symptoms of diabetes (both type 1 and type 2 diabetes) and can lead to severe dehydration, which if left untreated can affect kidney function. Polyuria is usually the result of drinking excessive amounts of fluids (polydipsia), particularly water and fluids that contain caffeine or alcohol. It is also one of the major signs of diabetes mellitus. When the kidneys filter blood to make urine, they reabsorb all of the sugar, returning it to the bloodstream. In diabetes, the level of sugar in the blood is abnormally high. Not all of the sugar can be reabsorbed and some of this excess glucose from the blood ends up in the urine where it draws more water. This results in unusually large volumes of urine. Diabetes inspidus - a condition unrelated to diabetes mellitus that affects the kidneys and the hormones that interact with them, resulting in large quantities of urine being produced. As well as being one of the symptoms of undiagnosed diabetes, polyuria can also occur in people with diagnosed diabetes if blood glucose levels have risen too high. If blood glucose levels become too high, the body will try to remedy the situation by removing glucose from the blood through the kidneys. When this happens, the kidneys will also filter out more water and you will need to urinate more than usual as a result. If you are frequently experiencing an increased need to urinate, it could be a sign that your sugar levels are too high. If you have access to blood glucose testing strips, you may wish to test your sugar levels if you are urinating more often than normal. Ants surrounding urine - diabetes? If you have diabetes but don’t have blood glucose testing supplies, you may wish to note down how often you are urinating and discuss this with your health team. Your health team should be able to advise whether the problem may be related to diabetes and any remedial action you can take. The most common sign of polyuria is producing abnormally large volumes of urine at regular intervals throughout the day and at night. If you are concerned about the amount you urinate and think you may have polyuria, you should make a note each day of how much you drink; how often you urinate and how much urine you produce every time you go to the toilet. You should consult your doctor if you have excessive urination over several days that cannot be explained by an increase in fluids or medications. This is the frequent need to urinate. Increased appetite is a diabetes symptom. Extreme tiredness, known as fatigue. Dizziness is an episode of unsteadiness and unbalance. Unexplained and unintentional weight loss. Blurry vision is a symptom of diabetes. Slow healing of cuts and wounds. Genital itching or regular thrush. Both are signs of diabetes.